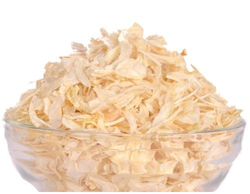 Prominent & Leading Manufacturer from Chennai, we offer chopped dehydrated white onion and dehydrated white onion flakes. We offer a wide range of Dehydrated White Onion Chopped. The product is prepared from sound, mature onions, which have been properly Washed, peeled, topped and tailed cut into desired cut size. After dehydration, the Product is sorted, sieved and graded. Odour/taste: characteristic flavor and odour of fresh onion. Usage: Where ever white Onion is used in chopped form, this Grade can be used, saving Time in Preparation and Cooking. Odour/taste: characteristic flavour and odour of fresh onion. Usage: Where ever White Onion is to be used in various Food Preparations, Dehydrated Onion Flakes can used, ideal for Bulk users,consumes less Time while cooking.